Bring a large pot of water to a boil. Add a pinch of salt, then boil cauliflower, covered, for about 7-8 minutes or until slightly tender, but still firm (the cauliflower will finish cooking in the oven, so it shouldn't be fork-tender yet). Saute onions and garlic in olive oil in a skillet over medium heat until onions just begin to caramelize. Remove from heat and set aside. In a large bowl, combine 1/2 cup Gruyere cheese, mozzarella cheese, yogurt, scallions and pepper. Stir in onion-garlic mixture. Spread mixture over cauliflower, then sprinkle with breadcrumbs, remaining Gruyere cheese and butter. Bake, uncovered, for about 30 minutes or until topping is a golden brown. Serve warm. I’m not a big fan of low-fat or fat-free versions of foods. My food philosophy is simple: I’d rather eat something with full fat in moderation than partake in something made from not-so-real ingredients. That said, there’s nothing wrong with trying to make a classic dish better for you and your waistline. That’s why I also like “healthifying” some of my favorite dishes using real, better-for-you ingredients. Forget fat-free yogurt or low-fat butter; if I can make a dish taste delicious using half the amount of fatty ingredients (but still keep them real), I’m all for it. 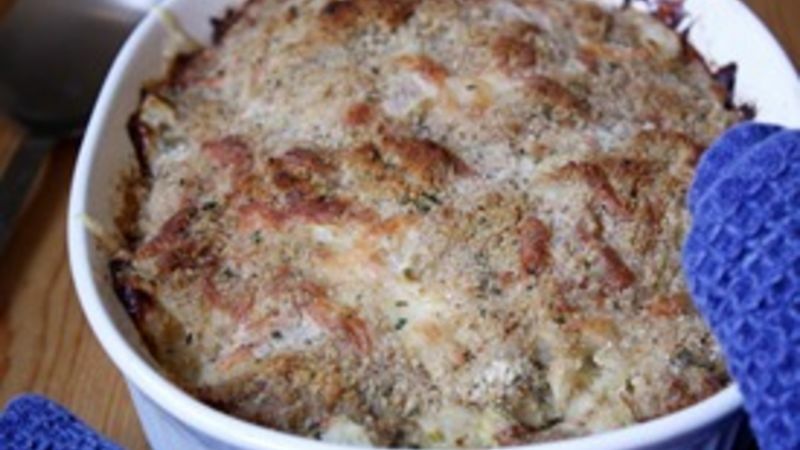 One of my favorite “healthified” dishes is this Skinny Cauliflower Gratin. It’s my lower-fat, lower-calorie take on the classic potato gratin side dish. Instead of carb-loaded potatoes, I use fiber-rich cauliflower; instead of heavy cream, I use yogurt; and instead of cheddar cheese, I use mozzarella and Gruyere. Of course, there’s still butter in the dish – but a lot less than you’d use in the regular version. The best part? The skinny version is just as tasty. I don’t claim to be an expert on creating nutritious food. Believe me, I’m the first person to admit that I’m a sucker for potato chips and peanut butter and chocolate-flavored, well, anything. But I do have common sense – and for me, cutting out unnecessary fat and calories and replacing them with wholesome, healthy ingredients is a great way to create a nutritious recipe that isn’t lacking in flavor. So the next time you need a filling, yet healthy, side dish for dinnertime, try this recipe. It’ll leave behind nothing but smiles -- and a much happier waistline! Check out more skinny recipes that taste great without the extra guilt.